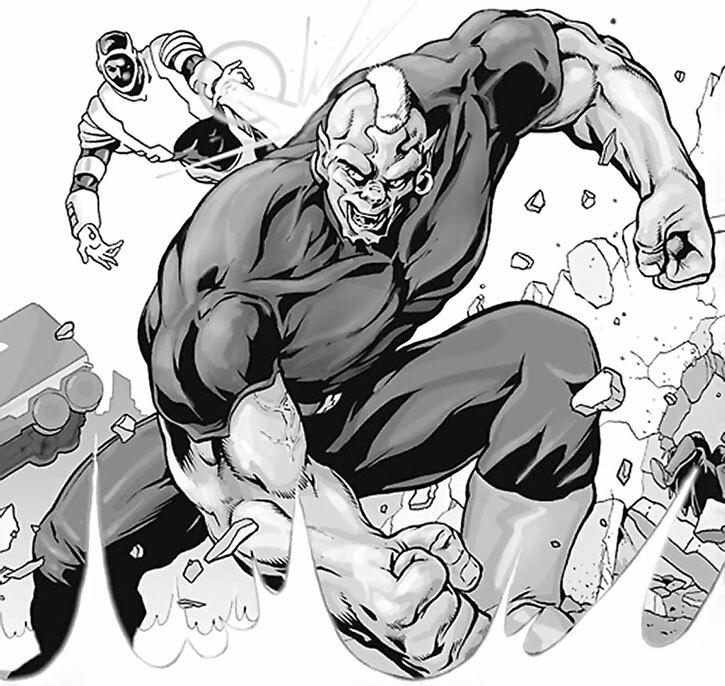 Ogre (Jack Stevens) is a character that features in almost every edition of the Champions super-hero tabletop RPG. He’s presumably there to provide a sample of the simplest super-villain type, the brick . 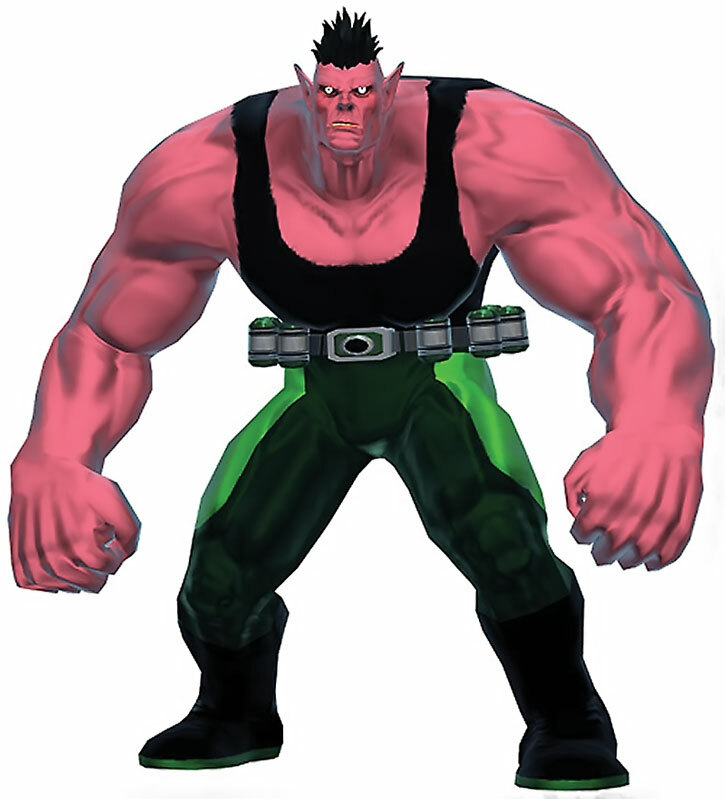 This profile is based on Ogre as he appears in the first, second and third editions of the game. By the fifth, the take is a bit different and he’s more stupid. I figure that there are already enough stupid bricks out there, and that the craftier (though still simple and straightforward) version of Ogre is more interesting. He can make for a quick, throw-away bad guy, or perhaps surprise your players when he gets some self-ambition and becomes a recurring villain or supporting character. Real Name: James “Jack” Stevens. Base Of Operations: Unrevealed, Arlington, Virginia? Height: 6’8” Weight: 345lbs . Strong, tough, and a talented fighter. Though he’s generally a bruiser, it’s not rare for him to surprise his opponents by using more technical moves such as throws, holds, technical blocks, etc. Ogre was once a normal man. He volunteered for an experiment because he needed the money to care for his crippled sister. Sadly, the experiment was being held by a raving, mad supervillain looking to create strong, mindless slaves. The devolution ray granted Stevens enormous strength and toughness. However, instead of serving the villain out of mindless control, he did so out of financial necessity and a need to contribute and belong. Finally having grown tired of following orders, he escaped to strike out on his own, doing the only thing he seemed to know, crime. Ogre’s look has evolved (or devolved, depending on how you care to look at it) over the years. 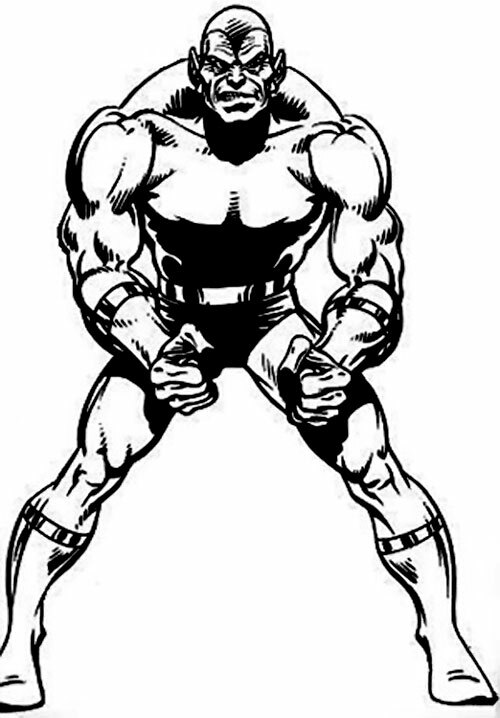 Originally little more than a good sized, pointy eared, green guy, he grew larger, then looked quite similar to a buffed up Skrull. Complete with furrowed forehead and brow instead of chin. Outfits have ranged in color, but were usually your typical skin-tight bodysuit and trunks, with simple accessories and a skullcap that covered his hair and came to a point down to his brow. 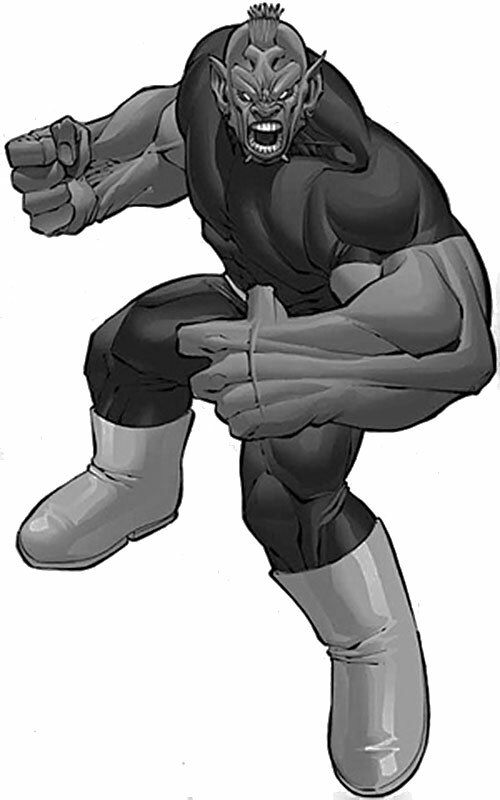 His current (5th ed) look seems even thicker in build, with slightly more jagged features, a short green mohawk haircut, and a brown, short-sleeved bodysuit with grey boots. Ogre may be simple minded, but he isn’t stupid. He speaks well, though in a very direct, straightforward manner. He knows he’s tough, but is prone to be overconfident in his abilities on occasion. Sadly, he lacks ambition. Ogre is content to merely use his abilities for simple smash and grab capers. He feels that with his looks, it’s all he’ll ever amount to now. There could be a decent, caring, productive member of society beneath his ugly exterior, should anyone care to find it. He’s SO generic he could fit in anywhere, likely as a starter bad guy for whatever new hero book they are trying to promote that month. MIA to Overconfidence, SIH of Bullies or Bullying, Dependant (Crippled Sister), Guilt, Minor Rage, Secret ID, Strange Appearance, Attack Vulnerability (-1CS OV vs Mind Blast). 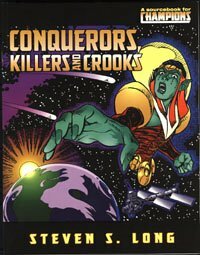 Source of Character: HERO Games’ Champions products, 1st and 3rd ed rulebooks, and Conquerors, Killers & Crooks specifically.